Futures Forum: Sidmouth Beach Management Plan >>> "renewed call for evidence from Sidmouth people to provide details of their personal knowledge of the beach and cliffs"
Futures Forum: Sidmouth Beach Management Plan >>> "Your views on potential solutions would be appreciated"
This month we start with the sad news that Jo Frith, a stalwart of the VGS, has died. Everyone remembers Jo as a friendly face who spoke sensibly and with intelligence. She was particularly committed to the Coastal Management Plan. 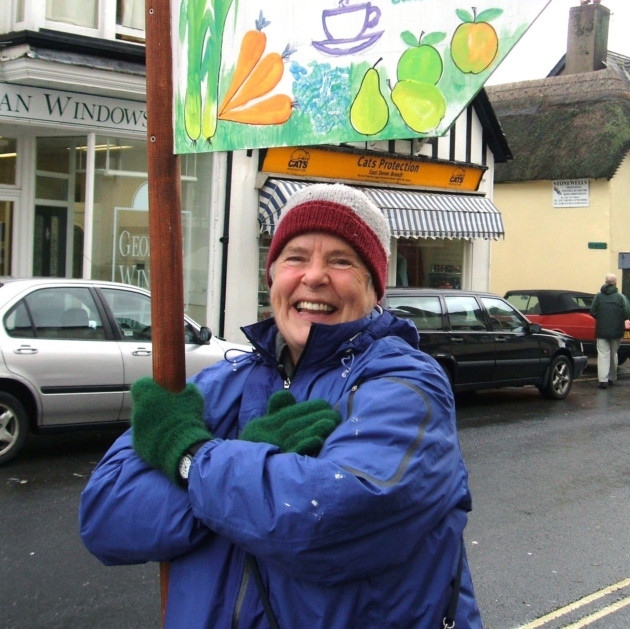 She was also the person who went outside in all weather to advertise the Market with her brightly coloured pole as well as providing a delicious fruit cake each month for the refreshments. We shall all miss her. If you wish to leave your thoughts in memory of Jo, please email them to info@visionforsidmouth.org and we will seek publish them. Friends, family and collaborators in all manner of local ventures have shared their memories of a ‘tour de force’ in the Sidmouth community. Countless tributes have poured in for Jo Frith (pictured), who died last week. On her retirement from a career in IT, mainly with IBM, Jo brought to the town, and Devon more widely, her keen analytical mind, together with wit, good humour and immense kindness. She had served as a councillor in the London borough of Richmond - and that insight into government made her an invaluable conduit between the Vision Group for Sidmouth (VGS) and local decision-makers. Her commitment to environmental sustainability led her to be the secretary of various organisations over the past decade, from East Devon Green Energy to the Independent East Devon Alliance (EDA). Many residents may have known her simply as the cheerful holder of a sign in the High Street, pointing the way to the monthly VGS farmers’ market. Her experience in Iceland and elsewhere gave her a unique insight on erosion and coastal management on the Jurassic Coast, and she was a fund of knowledge on innovative renewable energy projects that could be profitably applied to the coastline. She worked indefatigably to encourage local government to take action on flood management and to reduce the risks of flooding from rivers, sea and rainfall. In recent years, she made her home in Fortfield Terrace, where neighbouring flats were occupied by her 95-year-old father John, her sister Gita and her nephew Duncan. With her extended family, she strove to enhance the Fortfield Terrace community, not only artistically, but also by sharing resources and demonstrating models of energy efficiency. EDA chairman Paul Arnott paid tribute to Jo as ‘a wonderful soul who will be very deeply missed as a friend and as an outstanding, fair-minded, courteous and extremely witty activist’. Jo died suddenly last Wednesday (February 24) at the age of 71 after cycling to Sidford in the sunshine. Following a post-mortem, there will be a quiet family interment at the graveside. In a few months’ time, there will be a public celebration of her life. Make Fore Street pedestrian only ! ?